At Werrd, we’re all about ‘technical excellence’. That means we create tricky computer stuffs together with a spinny cutting machine to make jojos play great. With that in mind we designed – the HOUR. Then we tweaked it to make it even better and lo…the 2K13 HOUR was born. After that, we created the EIGHTY-SIX400 and then the MINUTE and all of them were deserving of being featured in the BOUNTY promotion. – a recognized Regional event, you will get a pick of the board… select ANY Werrd yoyo from the current range** (or possibly one of the Special Editions from the vault). 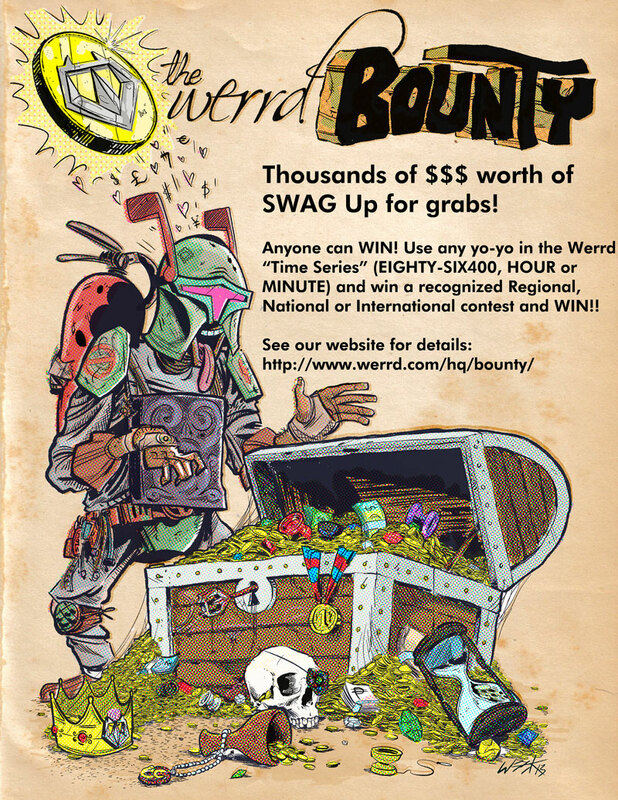 You are eligible to win the BOUNTY if you have competed and won a recognized Regional or National level Yo-Yo contest or if you take out a World Record using the Hour (see Terms and Conditions below). This is us backing our yoyos. Simple. Terms and Conditions of Entry: 1. You must use one of the Werrd “Time Series” yo-yos (EIGHTY-SIX400, HOUR or MINUTE) for your entire freestyle. If you change out during the freestyle, you must change to another HOUR in order to be eligible to win the BOUNTY. The BOUNTY is available for the following division 1A, 2A, 3A, 4A, 5A. If competing in 3A, all 3A pairs used must be HOURS. What are you waiting for – you better get a couple..!! 2. The contest must be a recognized Regional or National or International level competition. By entering you acknowledge that Werrd has the final say on whether any given contest is recognized or not. This is to prevent people from creating their own competition just for the sake of winning the Bounty. 3. You must notify us in writing by email to werrd@werrd.com within 14 days of winning the contest in order to be eligible for the Bounty prize. 4. Winners can win multiple events and claim multiple prizes. 5. The BOUNTY is availabe for all recognized Regional or National or International level competitions and Yo-Yo-related World Record attempts for the next 12 unless published otherwise.